The main difference between WebGet and WebInvoke is that WebGet is used to retrieve data while WebInvoke is used to update data. WCF stands for Windows Communication Foundation developed by Microsoft. It is used to develop service-oriented applications. The main protocol it supports is SOAP, but it also supports HTTP, HTTPS, etc. WCF WEB HTTP programming model provides the basic elements necessary to create WEB HTTP services using WCF. A large number of clients including web browsers are capable of accessing these WCF WEB HTTP services. Overall, these attributes describe how each operation connects to URI and the HTTP methods related to those URIs. WebGet attribute represents operations using GET. The user can directly access the endpoint by typing the URI to the service in the address bar. It is possible to send the parameters within the URI as query string parameters. Furthermore, it is also possible to embed the parameters in the URI. In addition, clients and systems such as proxy servers can cache resources based on the cache policy for the service. Therefore, WebGet is suitable to use for data retrieving. WebInvoke attributes represent operations using the POST, PUT and DELETE. The default is to use POST, but the programmer can change that by setting the method property of the attribute. WebInvoke helps to modify the resources. Therefore, this attribute is used to change the resources. In other words, it helps to update data. WebGet is an attribute that indicates a service operation is logically a retrieval operation and that it can be called by the WCF REST programming model. Whereas, WebInvoke is an attribute that indicates that a service operation is logically an invoke operation and that it can be called by the WCF REST programming model. 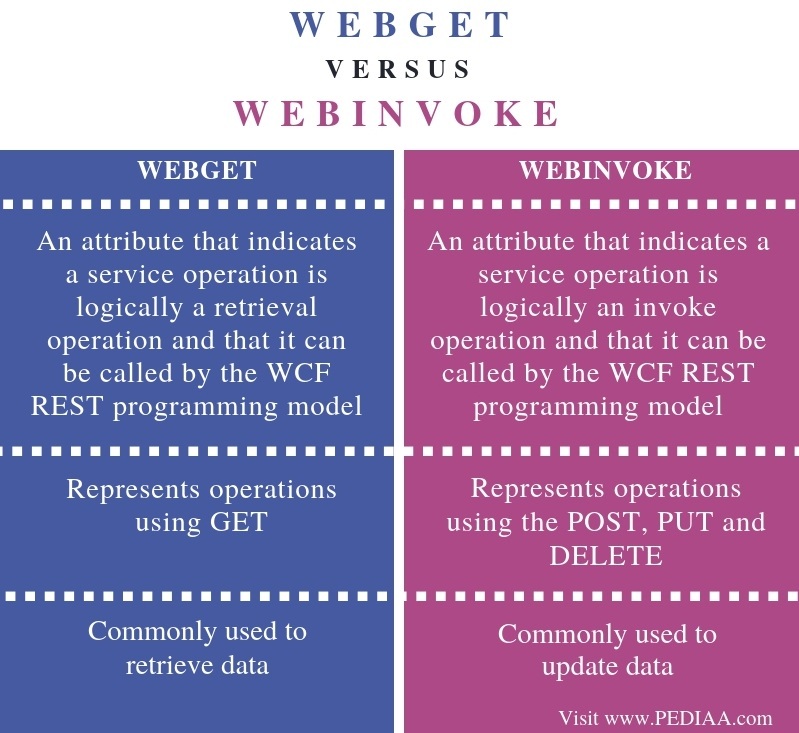 The main difference between WebGet and WebInvoke is that WebGet is commonly used to retrieve data while WebInvoke is commonly used to update data. Another difference between WebGet and WebInvoke is that WebGet attribute represents operations using GET while WebInvoke attributes represent operations using the POST, PUT and DELETE. WCF WEB HTTP programming model allows the developers to control both URI template and verb associated with their service operations (such as GET, POST, etc.) using WebGet and WebInvoke attributes. The main difference between WebGet and WebInvoke is that WebGet is used to retrieve data while WebInvoke is used to update data. 1. 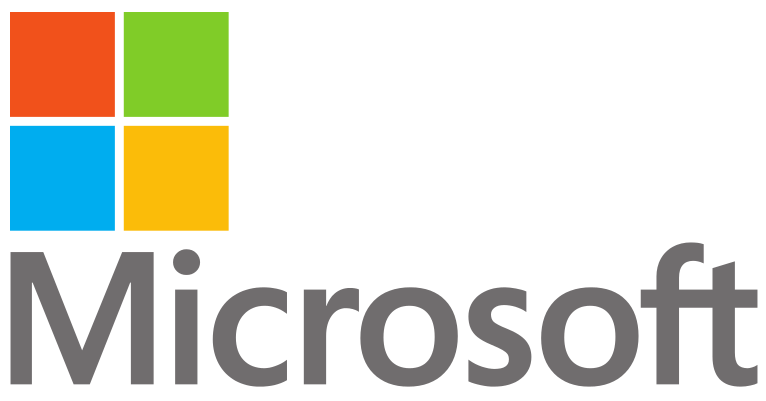 “WCF Web HTTP Programming Model Overview.” Microsoft Docs, Available here. 2. “WebGetAttribute Class (System.ServiceModel.Web).” Microsoft Docs, Available here. 3. “WebInvokeAttribute Class (System.ServiceModel.Web).” Microsoft Docs, Available here.